Awareness can change lives. 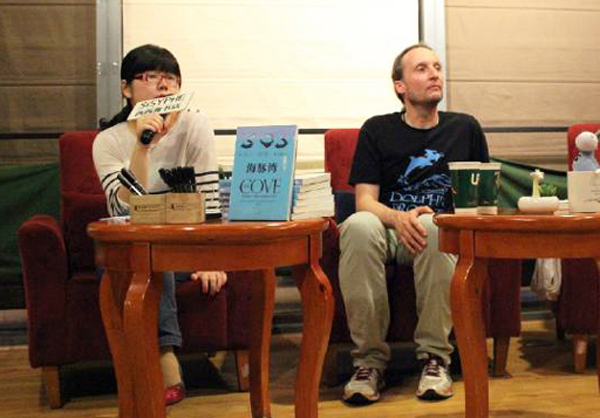 Chinese publicist for ‘The Cove’ book, Pearl Han, describes the book launch tour’s impact on her life. M y name is Pearl Han, and I work as copyrights manager at the ‘Zhonghua Book Company’. Based in Beijing, Zhonghua is a major Chinese publisher with over 100 years of history and a great reputation, particularly in Chinese traditional culture. I’m also the mother of a 3-year-old son and a happy wife. When I was little, I was afraid of cats and dogs and other animals, and so I never really had strong feelings for them. In my whole life, I never thought that one day I would have anything to do with animal protection and become an activist. Pearl Han and Hans Peter Roth at the hotest bookstore in Chengdu. 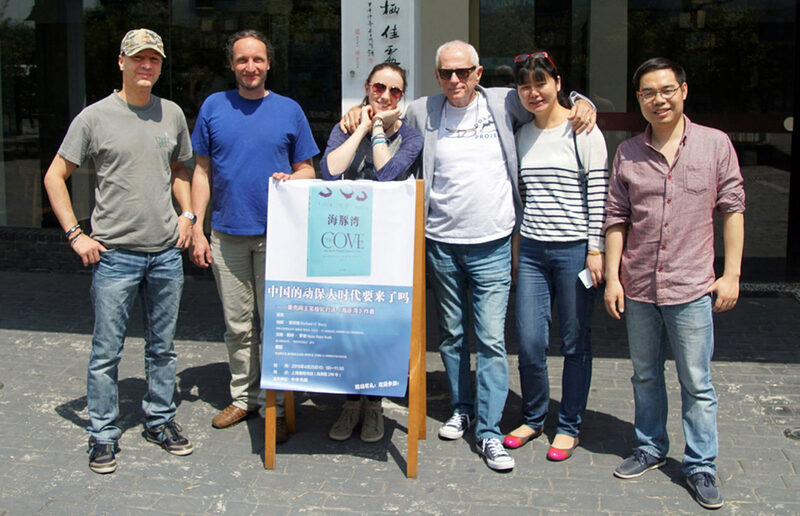 Right before this year’s spring festival vacation, my colleague He Long asked me to write a letter to Mr. Richard O’Barry and Mr. Hans Peter Roth, the co-authors of The Cove book, to invite them to China for the launch of the book’s Simplified Chinese edition. I thought writing a letter was an effortless gesture to help out a colleague, but one e-mail led to another and, before I knew it, I was officially assigned as the publicist for the book tour. Being a publicist is not what I usually do, and our publisher doesn’t usually publish books like The Cove. My colleague He Long just happened to get a Complex Chinese edition of it and really loved it, and he thought he had to bring the book to China. So, after a bunch of coincidences, I found myself on a book tour with Ric O’Barry! Before this, I had no idea who Richard O’Barry was, so to accomplish the job I did my homework and researched about him. I watched the Oscar winning movie The Cove, read the book, googled, and looked through the ‘Dolphin Project’ website. The study was really an eye opening journey. I’ve always known that animal performances are cruel because the animals are kept hungry intentionally, and that the training distorts their natural behaviours but, for the first time, I learnt that dolphins are highly socialised animals. For the first time, I learnt that dolphins are under stress in captivity. And for the first time, I learnt that a dolphin can choose to commit suicide. I’ve always been a rational person, and I’m not easily persuaded, I like to think on my own. I’m aware that there are a lot of problems on this planet, but they are never as simple as they seem to be. Coming from a country which is often misunderstood and has the finger pointed at it a lot, I understand that there’s always two sides to every story, and I believe that everybody has the right to explain themselves. Being a publicist is new to me so I have to be careful and sensitive with a lot of issues. From the research I did, I knew that activists usually had strong opinions, and that they might be judgmental. I was worried that my being rational might be in conflict with their being passionate. So on the morning of April 21st, in the lobby of the hotel in Beijing, when I met the team for the first time – the energetic Ric, the humble Hans Peter, the charming Sasha and the lovely Maria, I was walking on eggshells. I remember the first meal we had together, as a meat eater myself, surrounded by a bunch of vegetarians and animal protectors, and with basically no experience dealing with vegetarians, I was so cautious of any missteps that might offend them. When I was ordering, I went into details with the waitress to make sure there were absolutely no meat related ingredients in every dish. Over the next 9 days, it turned out I had worried too much. They are passionate about what they’re doing, but they just respectfully point out the blind spots without a hint of being judgmental. For them, it’s all about awareness. If you are not aware, they’ll provide the information. Once you are fully informed, it’s up to you to decide which way to go. And they listen! We talked a lot about where they stand and where I stand for the related issues. They totally got my points and respected my opinions. Before, I was never an ‘animal lover,’ and even though I knew something about animal protection and the cruelty of animal captivity, I never thought it had anything to do with me. As the mother of a three-year-old, I used to love taking my son to all the zoos and aquariums whenever we visited a new city. Since I started to work on this project, I learned a lot about dolphins, and I began to think about other suffering animals too, like elephants, rhinos, bears, and sharks. Most importantly, I began to think about what I could do? Sadly, I found out that we Chinese play a disreputable role in this. 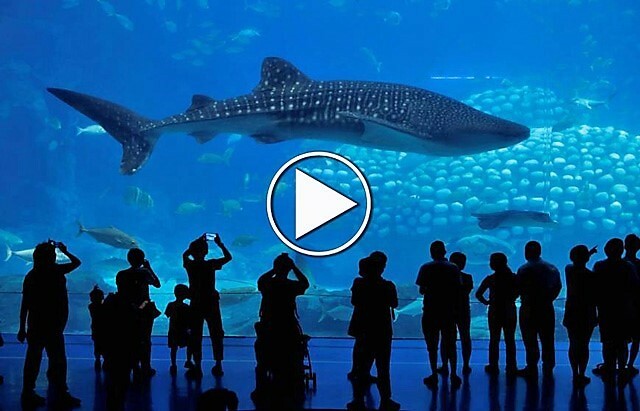 With the risen economy, many people can afford ivory accessories, shark fin soup, and many cities have built zoos and aquariums. But there’s a brighter side too, more and more Chinese have started to realise the importance of protecting animals and the environment. Earlier this year, there was a reality TV show called Wonderful Friends. It was filmed in a newly founded large zoo called ‘Chimelong‘ in Guangzhou, and celebrities acted as zoo keepers and lived in the zoo for weeks. Once it was aired, it drew great controversy immediately. They had two baby chimpanzees dressed in a human baby way, preparing them to become animal show stars. And in one episode, one of the celebrities rode a beluga for show. 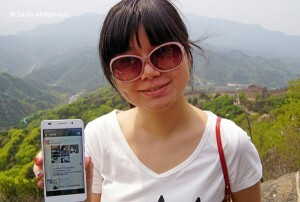 Huge amounts of criticism came from all over the Weibo (Chinese version of Twitter). The production company claimed they had wanted to create an atmosphere of loving animals. The critics pointed out that they had misled the audience in using celebrities. They had covered up the cruelty of animal shows with cuteness, and hid their real purpose of making a profit and advertising. Also that they had shown a lot of wrong ways to deal with animals, such as talking loudly around koalas, and standing very closely to a giraffe’s hind legs with their back turned to the giraffe. Along the tour, I kept posting on my Weibo and WeChat (another Chinese social media site, which combines What’sApp, Twitter and a blog tool) about the new things I learnt about animals and I shared the media reports about our book. A friend of mine who lives in New York posted pictures of taking her kids to watch a sea lion show. Funnily, even before I said anything, our mutual friends commented that Pearl is all against it now, and that one should not buy tickets to animal shows. Just a couple of days ago, I found out that a friend of mine became a vegetarian. I asked her why? Is it because of health issues or religion? She told me it was partly health, partly ethics, and because she was moved by her animal protection friends. The Customs have been focusing on busting ivory smuggling. Since 2012 til today, they have uncovered 321 cases of ivory smuggling and arrested 497 criminals. However, we Chinese still have a lot to catch up with. The huge market demand is still driving the hunting in Africa and Japan. Some of the animal protectors go to extreme lengths for their purposes. There are still misunderstandings about how to treat animals. It’s all about awareness. It’s not like we’re just evil, most of the people simply don’t know. They have never connected the entertaining dolphin show to the bloody slaughter happening in the infamous Cove. Once people know about what’s right and what’s wrong, they’ll start to think and act. And that’s what we should work on. During the tour, at every event we had, I was surprised that we were so welcome, and that a lot of people were already aware of the issues to some extent. Everybody was eager to know more about dolphins, and about what happens in the cove at Taiji. They wanted to dig in to Ric’s experience. At the end of every event, the audience kept questioning all of the team relentlessly. 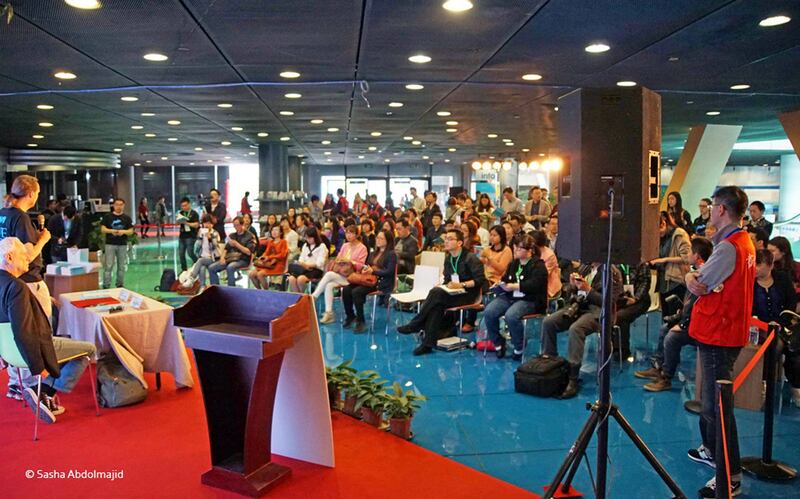 Chinese people are eager to learn and, more importantly, eager to change. 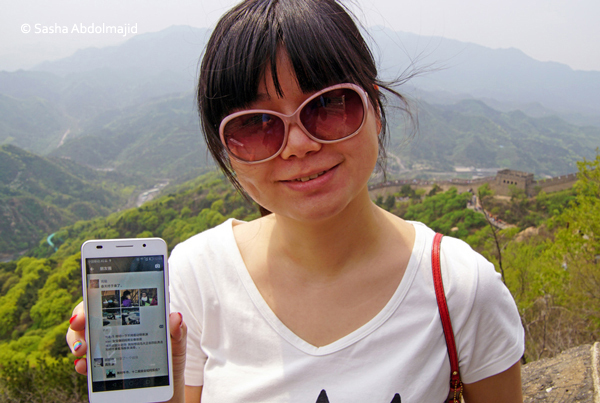 A tour like this, telling people the truth without being judgmental, is exactly the way to reach Chinese minds. After I came back home from the tour, my son wanted me to read him a book. It was an album of wild animals, including an elephant, lion, tiger, rhino, bear, dolphin, shark, which are all sadly in danger because of human activities. Instead of just naming them, I told him all about the wrong things that humans do to them and that we shouldn’t buy these animal products, or tickets to animal shows, in order to protect them. Surprisingly, he understood. Now, as a young child, he knows that wild animals belong to the wild and it’s wrong to keep them in the zoos and aquariums which aren’t their natural habitat. Being a parent gives you the privilege to touch young minds, and I’m really honoured to have the chance to teach him something right, something bigger than us. I finally realised what I could do. I can tell as many people as possible what I’ve learnt and let them decide which way to go. Just as how my eyes were opened, now I pass on my knowledge to others. Now that I have taken the first step, I know that an exciting journey lies ahead. Would you like to join me? I’d like to take this opportunity to say thank you to the team – what a wonderful tour! 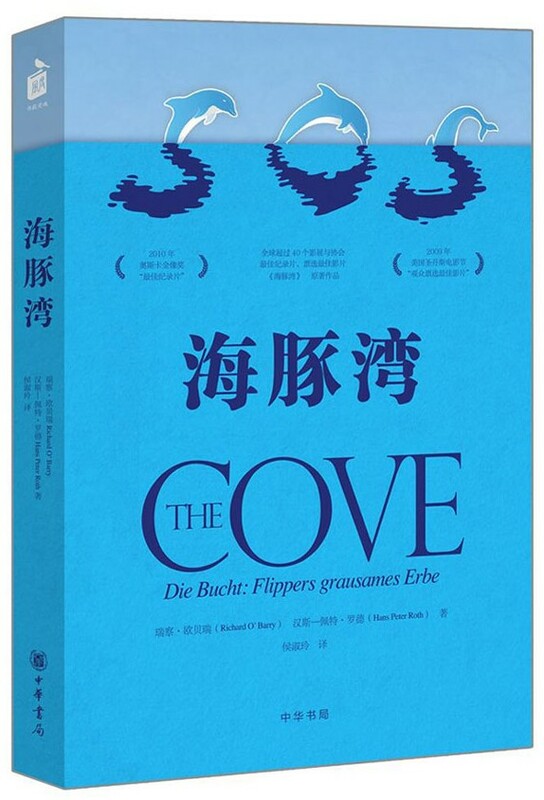 Many thanks to my colleague He Long for bringing The Cove book to China. And special thanks to Gaye Hunter for her heartfelt editing support, as well as to Sasha Abdolmajid for inspiring me to write this! This article is also available in Chinese. Big Hugs, Gaye! Thank you! We love you Pearl! Thank you so much for this I’m excited for the adventure ahead just like you! 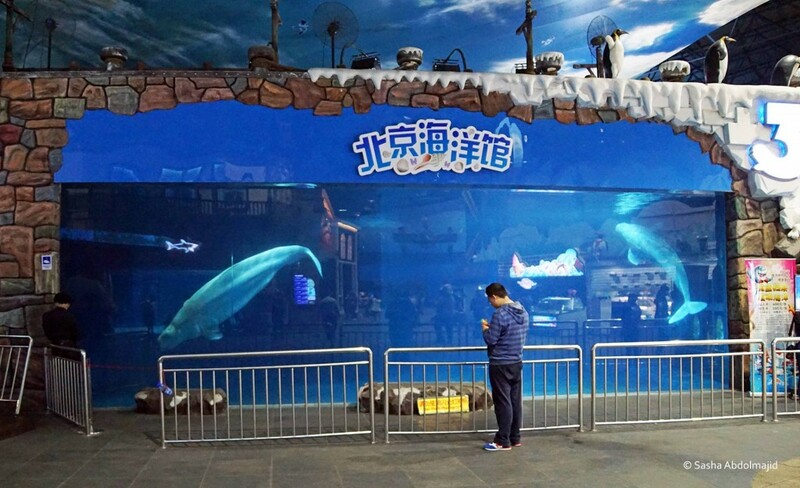 It is refreshing to hear a personal voice speaking out so clearly on the issue of cetacean captivity in a rapidly developing country like China. Only when humans realize that dolphins are non-human persons will we begin to treat them with the respect they deserve! Thank you Pearl for writing this awesome article. The story is full of hope for the future and hopefully it will be a eye-opener for many people. People like you really make a difference. Thanks so much, Pearl, your inspiring story gives me real hope! Thank you Dr. Spong. What I did is nothing compared to your decades of hard work. I’m so overwhelmed with receiving comment from people like you! Excellent article. Now, if you could convince the Chinese that the demand for Totoaba bladders (from the Sea of Cortez in Mexico) are going to make this deep water fish extinct, again, that would be a great feat. Also, hanging live puppies to eat is just too much. Regardless of ancient customs, cruelty to animals, mammals or humans is not acceptable. Thank you for your insightful article. Keep up the good work! The author did say that the Chinese still have a lot to catch up with. What I so admire and respect about the Chinese, Japanese and Faroese advocates/activists, is that they recognise the problems in their own countries and are working within to change them. You don’t find them throwing stones at other nations while living in glass houses themselves. I agree with you that customs which involve cruelty to humans or animals are unacceptable. So much more could be achieved in that respect, if advocates/activists worldwide followed the example of the countries mentioned above and worked predominantly on cleaning up their own backyards, as well as supporting and encouraging those in other nations doing the same. Thank you everyone for your warm and kind comments! This is so encouraging, you have no idea how touched I am right now! I know I didn’t do much and I’m not a hero, but I believe everyone can make a little difference. And It is us, the ordinary people who can save the world, not the heroes! Pearl – the story of your journey is so touching and very inspiring. I truly believe that each and every person who joins the fight to stop suffering makes a difference and especially respect those working on this in countries where animal welfare is not a priority. Thank you so much. Pearl, thank you so much for taking the time to write this. Thank you for including us in your journey and spreading hope for change. Blessings moving forward! 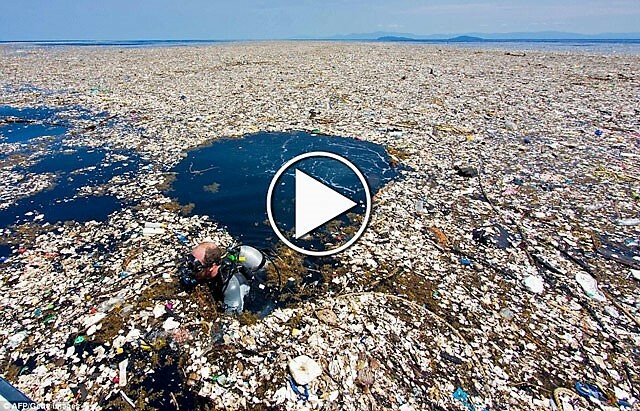 I am glad someone found ‘The Cove’ documentary eye-opening because that was its purpose. I watched it once and cried On almost every minute of it because there are not many people like Mr.O’Barry or Mr.Shepard. I would like to be am activist one day and I’ll like to save animals from human cruelty. The Cove was an experience for me not just a documentary. I would just like to say for the end, thank you Ric, Sam, Pearl and all other animal lovers that want to watch animals for a couple hundred years more. Why are hundreds of dead dolphins washing up on French beaches?